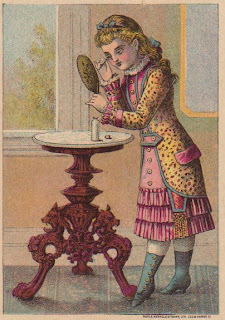 Some of the American companies using trade cards to advertise their products made a considerable financial investment for the creation of customized, beautiful, high-quality, eye-catching designs. There must have been considerable expense involved with these custom creations, to get just the right look, convey the right message, etc. 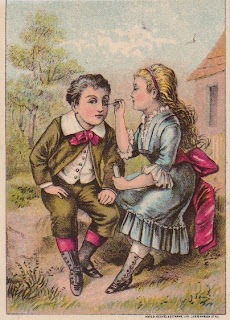 This trade card for Wells' Health Renewer, for example, conveys a clear message to the female consumer: this product will give you health. 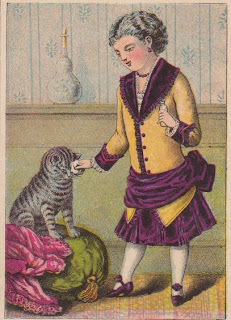 Notice that the card is done in pleasant pastels - pink (to match the young beauty's rosy complexion) and powder blue (to match her eyes) - soft, soothing, and reassuring. The graceful waves and flourishes on the words "Health Renewer" compliment the swirls and twirls of the young woman's flowing blonde hair. She's framed by a delicate lace headdress, adding a message of purity to her portrait. The veil, along with her, earring, pearl necklace, and gold locket hint that she is dressed and ready for some social occasion. The gold locket might perhaps hold the picture of her beloved? In fact, the image may be of a young bride, about to embark on a lifetime of wedded bliss, a fairytale ending which was only made possible because her life had been saved by Well's Health Renewer. The Renewer was a medicine to soothe nervous stomachs and to give strength and vigor to the system. What better stuff for a blushing bride on her wedding day? The card back carries quick messages about Wells' other products, leaving the front of the card to convey everything women needed to know about the Health Renewer. 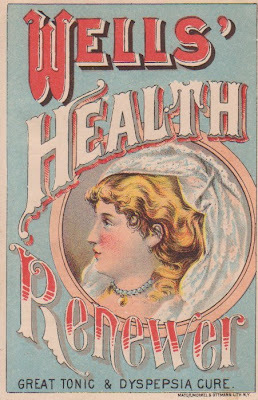 The Wells company was apparently satisfied and confident that the card front's message about the Health Renewer was effectively conveyed just through the use of design and color. I think that's pretty amazing and a sophisticated piece of advertising. On another Wells trade card we have a glimpse at someone who may have been this bride's counterpart - the man of her dreams. I'll share him with you tomorrow! I have been collecting bottles for a long, long time, and I've seen and read about many types of collections: based on a certain manufacturer, time period, location, etc. ; most bottle collectors collect for color. For example, a collector may want to have every possible shade of brown that a certain bitters bottle comes in: brown, sand, wheat, amber, honey-amber, chocolate-brown, chocolate chip, etc. (okay, I made up the last one). Now I admit that it's a pretty sight to see one size and shape bottle displayed in a window in a progressive rainbow of hues, but here's what I don't get: a bottle label is often considered a deterrence to collectability. Huh? That rationale is basically that you can't appreciate the pretty colors and age of the glass if there's this old label pasted over a part of the bottle. I understand what such collectors are saying, but I just don't feel that way at all, myself. The label is HISTORY! It gives the bottle it's identity and often its character! MOST bottles did not have unusual shapes, colors, or embossing; all the proprietor could afford was the label. But those labels told the story! Whether it was a liquor bottle, a medicine, a cleaning solution, a flavoring extract, shoe gloss, or whatever, it gave the bottle its reason to exist! Labels tell who made the product, what it was, what it was for, where it was made, often clues to when, and much more. 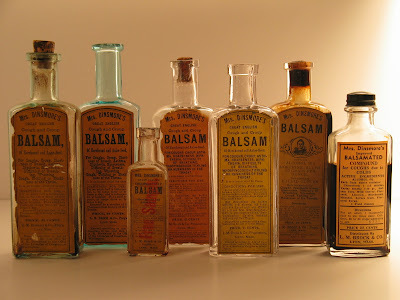 When it came to medicine bottles (obviously my favorite kind), it also listed what the medicine would cure. It was identification, instructions, and advertisement all in one! Take this image for Dr. Abbott's Blood Purifying Sarsaparilla, made during the 1880s in Lynn, Massachusetts. The bottle is a common shape and the common aqua color (the brown you see is the dried residue of its contents). There is no embossing to tell any story. If the label wasn't on there, it would be considered a "junk" bottle by virtually every collector out there. Heck, even I wouldn't care about it. But the a-m-a-z-i-n-g label tells a story - WOW, what a story! After years spent in the treatment of diseases, careful study and experiment, I am enabled to give to the world a medicine which I consider has no equal. Its composition is purely vegetable, and is designed to work chiefly upon the organs of digestion, assimilation, Liver, and Kidneys. It has also a specific action upon the heart. It increases the activity, and power of the Digestive organs, thus assisting nature in the digestion, assimilation, or transformation of our nourishment into a pure and vital fluid (the blood), which carries Vitality, Strength, and Vigor to every tissue. It has a cleansing and tonic effect upon the liver, by which bile is removed from the circulation. It produces an active and healthy condition of the kidneys, thus assisting in the removal of all wastes, and poisonous elements from the system. It also gives tonicity, force, and regularity to the tissues of the heart. There are also combined those principals which tends to overcome Constipation, Nervous Prostration, and to the extermination of Scrofulous, and Cancerous Humors, and is an excellent remedy for the cure of Dyspepsia, Sickheadached, Bronchitis, Catarrh, Rheumatism, Neuralgia, Jaundice, Dropsy, etc., diseases tending to Consumption, and of the Urinary, and Reproductive Organs, Female Weakness, Skin Affections, and all diseases arising from an impure state of the blood. Many valuable testimonials might be added, but a trial of the remedy is the only convincing proof of its true merit. For an Adult, one Dessert Spoonful after meals, or sufficient quantity to gently relax the bowels; for Children, from five drops upward, according to age. C.S. ABBOTT, M.D., Lynn, Mass. Can be procured of any Druggist, or direct from Manufacturer. Now here's what some of you probably don't know: a small number of the extreme collect-for-color bottle collectors will remove the label so the light can show through the glass; I have been told this by one or two collectors who do so. That just stuns me. What a waste; what a tragedy. if they like colored glass so much, why don't they just collect colored lamp shades or learn to make stained-glass windows! Good grief. Thank goodness that such a collector would have no motivation to take the label off Dr. Abbott's Sarsaparilla - the bottle is boring glass - thank goodness. I've tried to imagine it in some bright, eye-popping color, but it just doesn't work for me. 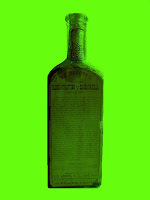 Dr. Abbott, your quack medicine bottle is plain and homely ... and one of the most treasured in my collection. There was only a smidge more than three teaspoons of medicine in the bottle, so the user better not have had a bad case of diarrhea, dysentery, cholera morbus, or whatever, because they only had three doses! Only enough to get cured in three hours!! This medicine was to be added to water - I sure hope they didn't use the bacteria-laden water that got them sick in the first place! In the 1870s, druggist Warren Toppan of Lynn, Massachusetts made and sold Calcutta Cholera Mixture. It must have been somekinda powerful: the bottle is only 3.75" (9.525 cm) tall from base to the top of the lip and held only 3.25 teaspoons of cure. That's okay, huge medical breakthroughs often come in small packages, right? Penicillin: big-time disease cure, small petri dish; aspirin: whopping headache cure, small pill; Calcutta Cholera Mixture: breakthrough cholera cure, small bottle. You've probably never heard of this quack cure. Its maker did not become rich or famous and he did next to nothing to advertise this medicine. This may seem to be extraordinary modesty given that he was claiming to have invented a cure for cholera. If given in the forming stages of Cholera, it will arrest the progress of the disease. In other words, if you're too far gone, Toppan's cure can't be blamed. And if you're not too far gone, it really only promises to stop the disease's progress, not knock it out of your system. So at best, the stuff won't let you get worse, unless you are already worse, then tough luck, Charlie. It's what small print was invented for. Americans watched warily after the first (and worst) cholera pandemic hit the U.S. in 1832 and other scares in 1849 and 1866. But in 1849 John Snow of England demonstrated that cholera was spread through fouled water and many U.S. communities began to tap cleaner water sources and setting up water filtration systems. Lynn had a water pumping and filtering system by 1870, so why was there a need for a medicinal cure in Lynn in the mid-1870s? Like many cities in the U.S., Lynn, Massachusetts was getting crowded. Its shoe factories required many workers; tenements stacked next to each other, forming three-story urban jungles. Poor immigrants filled the housing and were condescendingly regarded by the upper classes as a necessary evil. Delicate white bejeweled fingers pointed disdainfully at the poor as the source of filth, squalor, and disease. Toppan's Calcutta Cholera Mixture was not just a promised cure of the choleric symptoms that came from contagious gastrointestinal diseases, but also was an implied cure from the filth of the slums spilling over into upscale lives. It was bad enough if you got dysentery or cholera morbus, but even worse that you got their diseases, making you no better than them. 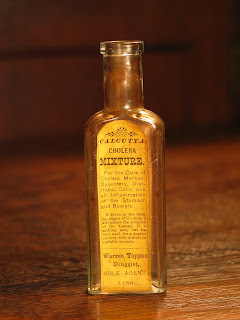 Warren Toppan's Calcutta Cholera Mixture was a cure for physical illness and social downfall. Small bottle, big attitude. So your friendly local phrenologist has checked out the bumps on the heads of you and your potential girlfriend and determined the two of you are a great match. Congratulations! Now what gift do you buy a girl with perfect bumps? It's got to be something special, something that will be close to her heart. 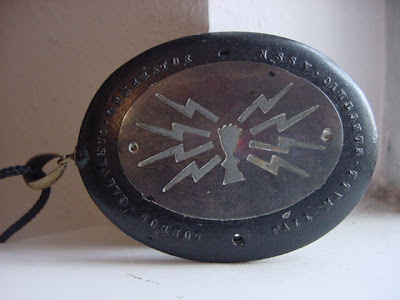 Hey, how about one of those nifty galvanic necklace things that everyone is talking about (at least they were in the early 1880s, anyway). They were made in London and New York by George A. Scott, the same guy that invented those amazing Electric Hair Brushes that let you brush the headache out of your head in no time! Hey, if she likes this galvanic generator pendant, maybe you can get her the hair brush for Christmas! But let's focus on the pendant first. 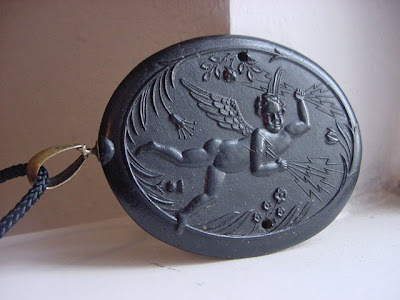 This little galvanic charmer is made of fashionable gutta percha ("a beautiful material resembling ebony"), the design on the front is of a winged cherub flying au naturel, through a lovely flower garden. Could it be Cupid himself? If so, then Cupid has modernized, because instead of arrows, this guy's got fists full of lightning bolts! Hey, that could hurt, couldn't it? But you see, dear, that's the whole point. Old Cupid has updated his arsenal because there are better ways to get to your heart. This is not just another piece of jewelry. This is a Galvanic Generator. Wear it like a locket over your heart. 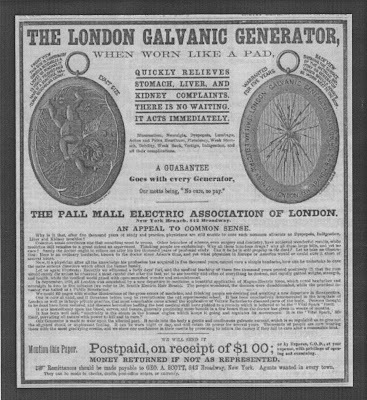 Flip it over to the backside to see the secret of its power - the Galvanic Battery or Generator. See the beautiful copper shield inlaid with a zinc design of Cupid's fist holding those lightning bolts? Well, when those two metals interact with the chemistry of your body, you will feel the electricity's warm current coursing through you and your bumps (and probably creating some new ones), without causing the slightest shock or unpleasant feeling. These days I can't watch television without being accosted by a barrage of commercials offering to help me find a date. Never mind the fact that I have been very happily married for 32 years; they don't know or don't care and I suspect that if I'd pay the fee, they'd take it. One of the most heavily marketed dating services is eHarmony, an outfit whose pitch is the excellent results they've accomplished through the use of an extensive profile about your likes, dislikes, interests, and character traits. Each hopeful applicant fills out the profile survey and the computer does the rest, matching up profile answers to find the ideal date or mate. Not real romantic, but probably safer than bars and clubs. "Taking it for granted that the man has arrived at a marriageable age - twenty-eight or thirty - and that he be of sound mind and perfect health ... he should avoid ... any woman having ill health, and especially if she be of a family having consumption or scrofula in its organization. There is no more important peculiarity to avoid than this one of inherent or transmitted sickness." He then (wisely) recommends avoiding hysterical or lazy women, as well as those that wear corsets ("avoid them as you would the plagues of Egypt, for they encompass sickness, premature decay and death"), small women (unless you're a small man), ignorant or poorly educated women (those that have learned to speak foreign languages, sing operas or play piano), those with "a superficially beautiful face," or women who are "overloaded with outre-shaped ear-rings, bracelets, finger-rings, and other cheap, gilt trinkets," false hair, and extravagant dress with false forms (bustles, hoops, etc.). So how's a guy supposed to see past all the superficial beauty, sexiness, and class (assuming he wants to, that is)? 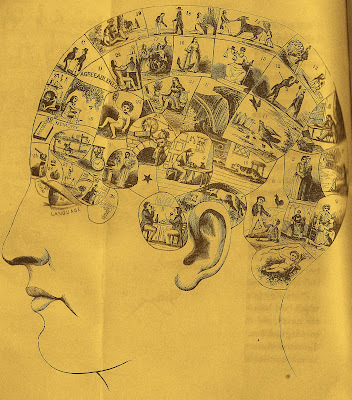 Cowan's answer: Phrenology - the determination of human attributes by measuring the size, shape, and features of the head. "Go to a good phrenologist and obtain a written analysis of your character, with a fully marked chart, which retain for comparison. When you , in your search for a wife, come across a woman who you think has an appearance of approximating your standard of character, have her secure a chart ... and show it to you, when, having all her perfections and defects in print, you can compare it with yours. ... If the comparison is favorable to a perfect union, then an engagement may be formed, and until this precise point is arrived at, love, impulse and the feelings should not be exercised, but kept perfectly dormant. ... if you allow your feelings and impulses to run rampant, instead of choosing and marrying a woman suited to your characteristics, you will probably choose and marry a ringlet, a dimple, a set of white teeth, a silky eyelash, a peach-blossom cheek; a lithe and willowy waist, a glimpse of a pretty ankle, a chance touch of tender taper fingers, the lingering echo of a winsome laugh ... or any of numberless beautiful things ..."
For over twenty years I have collected the medicine bottles, advertising, and promotional items associated with a 19th century proprietary medicine called Mrs. Dinsmore's Cough and Croup Balsam, made in Lynn, Massachusetts. 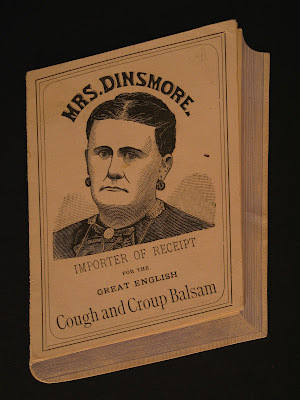 The advertising (and a few of the bottle labels) have the stern image of Mrs. Dinsmore. Products like Aunt Jemima Syrup, the Betty Crocker Cookbook, and even Chicken of the Sea Tuna became HUGE commercial successes using images of women that never existed and it set me to wondering, was there really a Mrs. Dinsmore and if so, who was she? I mean, gee whiz, if she was real, why couldn't they use a friendlier image of her, maybe one that is at least smiling?? I realize she's not as cute as Betty Crocker or Aunt Jemima, so would her medicine have sold better with a more fetching image? Hmmmm - Chicken of the Sea Cough and Croup Balsam - umm, maybe not. 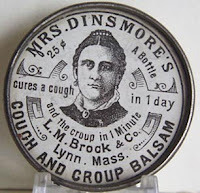 Well, through a combination of collecting, research, and pretty nifty detective work, I was able to determine that there really was a Mrs. Dinsmore, there was a reason she wasn't smiling, and her remedy sales were pretty terrific for decades, even though she didn't have blonde hair and a fishtail. You can check out the whole story by looking at an article I published a few years ago: The Man Behind the Woman's Face (just click on that title under the sidebar heading, "MORE FASCINATING QUACKERY" in the melon-colored sidebar on the right). Every time I look over that article, my thoughts wander to the years of research, hundreds of miles travelled, and many dollars spent in my quest for the truth about Mrs. Dinsmore. I found out she existed, as well as about her parentage and siblings, and her husband and children; I followed them, figuratively and literally, as they travelled from China to St. John's, New Brunswick, Canada, then to Pittsfield, Maine, then to Lynn, Mass. - and why they made each move. I found out why their house smelled and I met their descendents who live in a wonderful house. And I found out that I was able to buy my first house because of her medicine. There's so much of a story behind the story of Mrs. Dinsmore. I thought it would make a great follow-up article to the first, but it still remains to be done. Maybe I'll do a blog entry in the future about Finding Mrs. Dinsmore. But right now, it's supper and I'm hoping that Aunt Jemima, Betty Crocker, or the mermaid have something waiting for me in the kitchen. Quackery is alive and well, but unfortunately, its victims are not. Dr. Christine Daniel, 55, has been arrested and charged with defrauding her terminally ill cancer patients, promising them they would be cured with the combination of her own medicine (made from herbs collected "around the world") and prayer. If convicted, she could spend up to 80 years in jail. At least six patients, ranging from 4 to 69 yrs old, died within seven months under her care. The Associate Press quoted Assistant U.S. Attorney Joseph Johns to have said, "This is an example of a doctor who is preying upon the most vulnerable people in our society. These patients were told they were being cured, but they were being eaten alive by cancer." Daniel sold them a remedy she called "C-Extract" that she said would work not only on cancer, but even on multiple sclerosis, hepatitis, and Alzheimer's and Parkinson's diseases. She told prospective patients that when they combined this brown liquid with prayer, their cancer would likely be cured. She even said on a television broadcast, "We have seen the dead raised." I thought about giving this doctor an AQUA, but then I decided to be a good American and let our courts find her guilty or not guilty first. Some of you are probably thinking I'm being wimpy not giving her the award right now; maybe I am. I obviously think the reports about her quack loudly. Maybe there's another side to the story, so just in case and in the spirit of fairness, I will let Blind Justice decide. But I'm polishing up an AQUA just in case. "It's so easy, a child could do it." Advertising images can say so much without ever uttering a word. 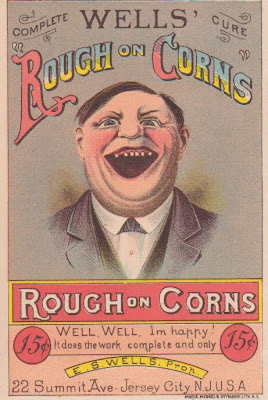 The Victorian advertisers understood this well and capitalized on the concept. Dr. Isaac Thompson's Eye Water had at least eight different images (that I know of) showing the use of this product by children. Applying a medicine to the eyes would seem to be a delicate affair requiring skill and a steady hand, but everyone in the Dr. Thompson card series display nothing but confidence and capability. Who needs a doctor? With this medicine, you don't even need an adult! The eye water was promised to be good "for all complaints of the eyes," so, not only are children using it and applying it, the suggestion is also implicit that the person suffering from things that may be causing vision problems (blurriness, obstructions, and even partial blindness) could nonetheless apply the medicine to themselves. As the second image demonstrates, use of this medicine allowed one to "doctor" another - painlessly and effortlessly, of course. Then the last image shown today shows another form of patient - a cat. Besides the "good for man or beast" implications, the image also demonstrates that animal owners could treat their own beasts and not have to undergo the expense of a veterinarian, either. No matter how adept the girl in this picture, I can't help but admire how calm and patient the cat is, too! In all of the images, the children are dressed impeccably, not making the least little mess of their clothes or surroundings with spills. In the hands of children, the 25-cent bottle is money well-spent, although by the upscale look of their clothes, it looks like their parents didn't have to worry a whole bunch about a quarter for a bottle of medicine. This medicine was said to have been "in constant use since 1795," and it existed until at least 1939, but its heyday was from the 1870s through 1890s. These cards date to about 1880s.